Right. It seems my personal Halloween circumstances have changed in very recent years. Having spent almost all of them since 2000 with my best mate, in either of our London flats, decked out in pyjamas, rooms lit only by flickering tea lights and scary pumpkins, Caribbean Chicken Stew bubbling away on the hob, red wine flowing, and horror movie at the ready, I now find myself living in the middle of the countryside far away from Kate. And to make matters worse this year, it seems I will be alone on Halloween for the first time. 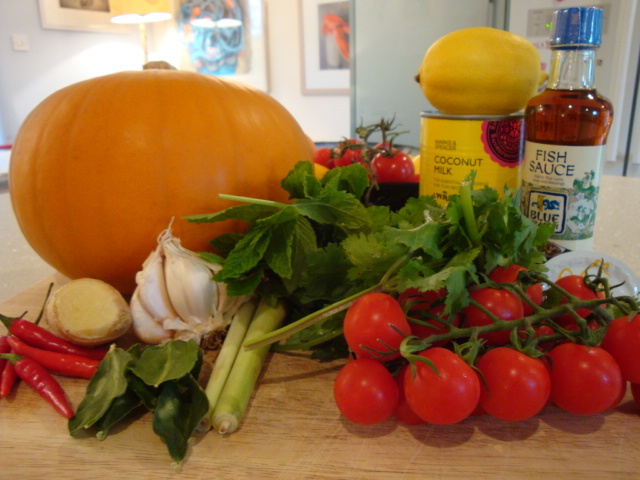 So to ring the changes I’ve decided to make something different for my supper, and after a bit of searching have chosen a Nigel Slater recipe for a pumpkin laksa – a hot and aromatic coconut broth with noodles, padded out with tomatoes and pumpkin in honour of Halloween. I reckon a big bowl of soup is similar enough to a big bowl of my old favourite stew so as not to be too disconcerting, but more zingy and enlivening; less soporific. And a good thing too as I’ll need to keep my wits about me next Wednesday with no-one to protect me from the monsters and ghouls lurking outside in the dark. And Kate, whether you stick with tradition or ring the changes, I hope you have a Happy Halloween. I’ll miss you! 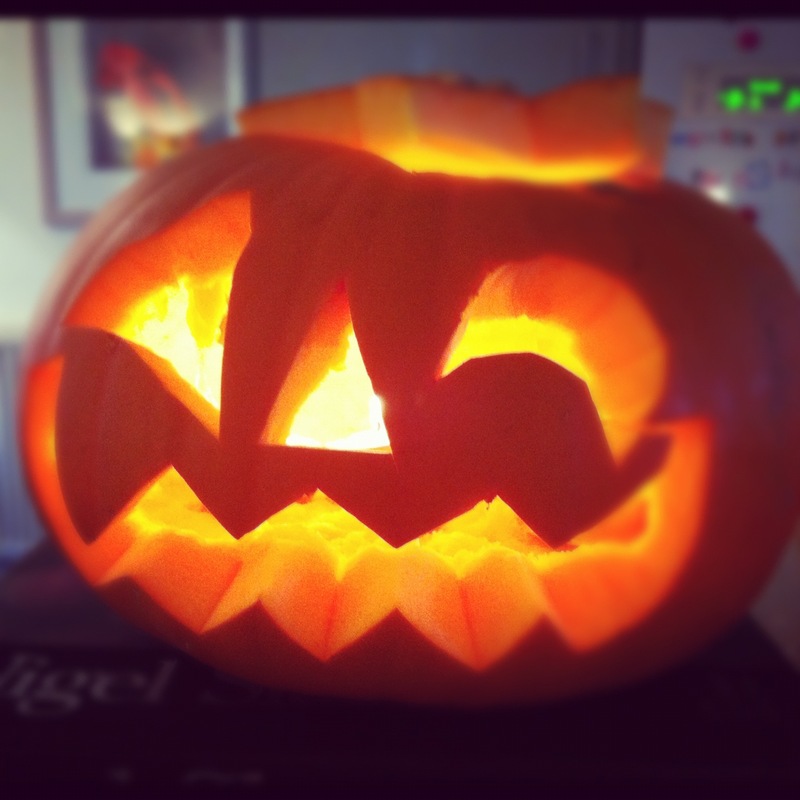 If using the pumpkin to make a scary lantern then zig-zag the lid off, scoop out and discard the seeds, then scoop out the flesh in large chunks if possible. A melon baller can be quite good for this depending on the size of your pumpkin – or just shred the flesh out as best you can with a spoon. 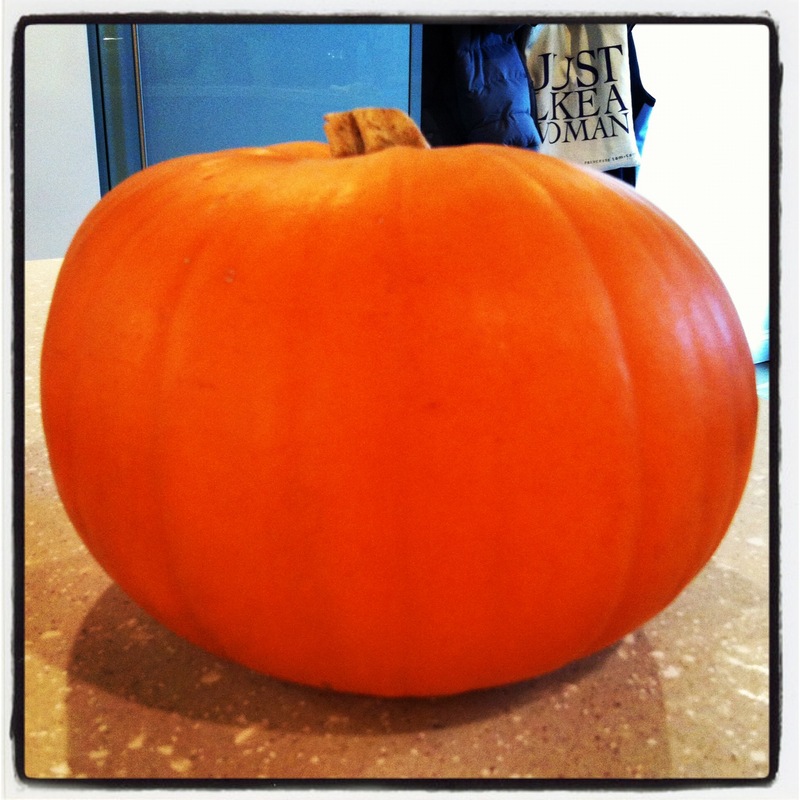 If you’re not carving your pumpkin then just cut the skin off and chop the flesh into 2cm chunks. Steam the pumpkin flesh in a steamer, or in a colander over a saucepan of simmering water, for roughly 10 minutes til tender and take off the heat. Chop the chillies (I left the seeds in), peel and roughly chop the garlic and ginger, and roughly chop the lime leaves. Discard the outer leaves of the lemon grass and chop the inner ones. Wash the coriander stalks and put all of this lot into a small food processor along with half the coriander leaves. Blitz to a pulp with a tbsp of veg oil. 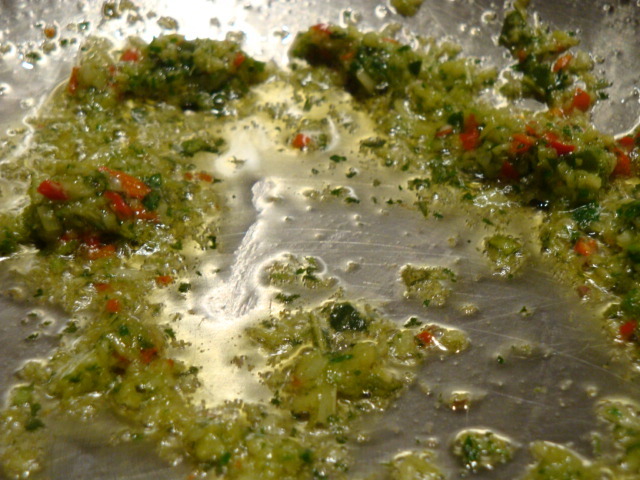 Place a nice deep pan onto a moderate heat and add a heaped tablespoon of the spice paste to a splash of vegetable oil. Keep the rest of the paste in the fridge for something else (but you need to make the quantity above otherwise it won’t blitz). 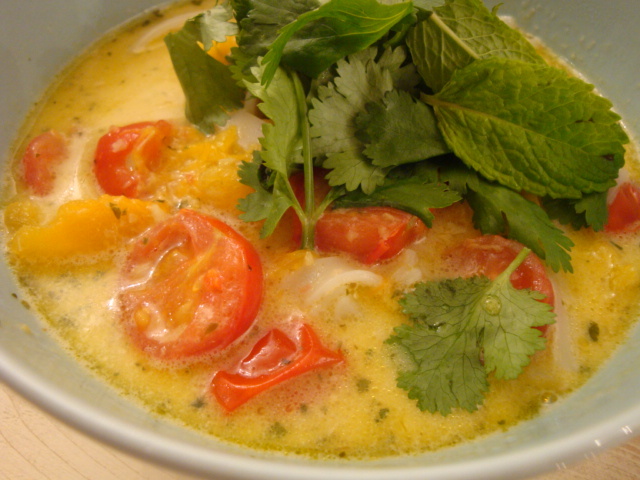 Fry it for a couple of minutes stirring so it doesn’t burn, then add the stock and coconut milk and bring to the boil. Cut the tomatoes in half and add them to the soup with the fish sauce and lemon juice, reduce the heat and simmer for about 7 minutes. Meanwhile boil the kettle and cook the noodles according to the packet (usually sitting them in boiled water from the kettle for 5 minutes is enough). When the tomatoes have softened add the pumpkin chunks to the pan and cook for another couple of minutes and taste for seasoning, adding more fish sauce or lime juice if you like. 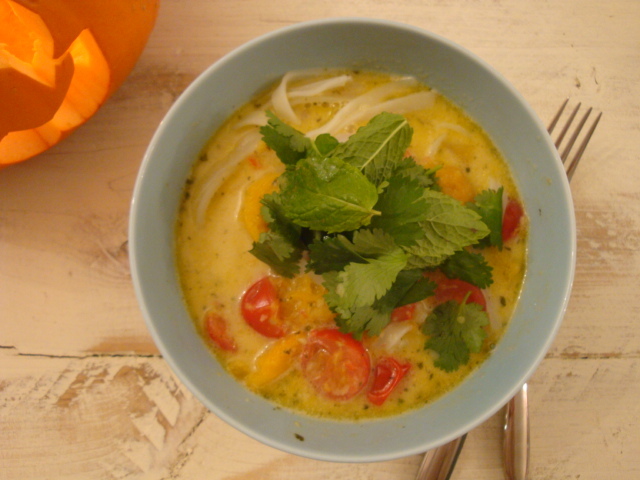 Place a swirl of cooked noodles into 2 deep bowls, ladle the soup on top and scatter with mint and coriander leaves. Savoury, hot, aromatic, zingy and satisfying! Thanks, you gorgeous ball of spooky orange lushness! Related Posts: Halloween; Cackle Cackle! Looks delish! I am trying this out at the weekend.